In the last few days I finished a small group of paintings to add to the several I had already submitted for the West End Gallery‘s annual Little Gems show that opens on Friday. I hadn’t been planning on doing these additional pieces as I have other work that needs to be started. But there was something in the original pieces that I took out last week that lit that spark that I had been futilely searching for in the first month of the year. So, I thought I had been stick with it for a bit to see where it goes. 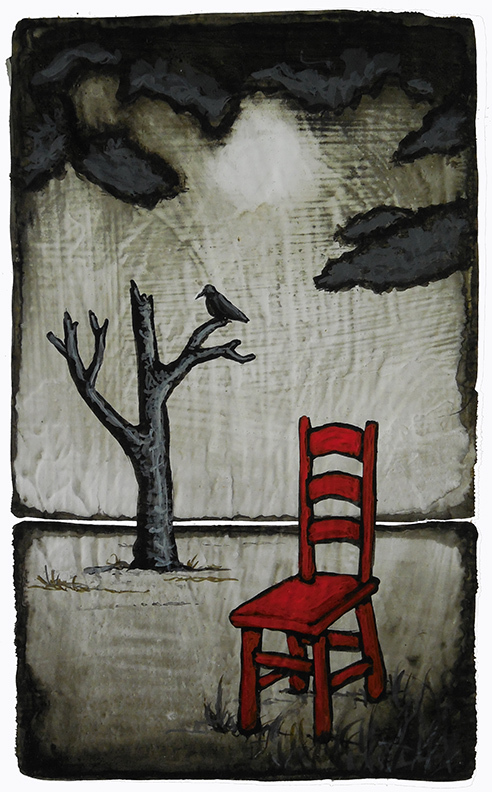 This piece, which I call Sorrow’s Companion, is one of the new paintings to emerge. Since it’s been done, I keep coming back to this one to just peer at it, all the while trying to discern what I am seeing and feeling in it. There’s something very sorrowful in it’s imagery. The dark clouds in the sky. The empty chair. The dead tree with the lone crow on a branch. The empty horizon. It all point to the sorrow of loss of someone or something. Yet, despite the sense of sorrow there is dull sunlight peeking through the gray in the sky. As the 14th century German theologian Meister Eckhart pointed out in his words at the top of the page, light is found in the darkness and is always nearest in our sorrow. The light is sorrow’s companion. So, I see this piece as having an air of melancholy but it is an optimistic melancholy, if there can be such a thing. Maybe this comes from understanding that true sorrow comes from knowing the feeling of true love. And there is a certain joy in just having experienced that feeling that lingers through the sorrow.